Does the lawyer know injury law? At The Law Offices of John Day, P.C. our focus is on civil litigation and injury cases. We do not handle real estate matters, bankruptcies, DUIs or other criminal matters, will or trusts or corporate matters. But, we have handled almost every type of injury case and some of the more common ones we handle can be found here. John Day not only knows injury law, but he also literally wrote the books on injury law in Tennessee. See them all here. These books are cited by judges and routinely relied upon by other lawyers in the State. Does the lawyer have the resources to handle my case? In complex products liability and medical malpractice cases, the expenses associated with proving your case can be in excess of a quarter of a million dollars. Expenses in even more "basic" cases can run in the tens of thousands of dollars. Can your lawyer afford to advance those costs and hire the best possible experts? Some lawyers will not advance case expenses. Or, in cases with large expenses, some lawyers require their clients to obtain litigation loans with unconscionable interest rates. At The Law Offices of John Day, P.C. we advance all case expenses, and we never ask our clients to obtain litigation loans. What does the lawyer charge? Almost all injury lawyers handle cases on a contingency basis meaning they only get paid if they win. Some folks think that a highly experienced, well-regarded personal injury lawyer will take a larger percentage than a less experienced attorney. But that is not usually the case. But to be sure, ask the lawyers you are considering for specific information about their charges. For more information on how we handle fees and expenses, click here. Is the lawyer listed in Best Lawyers? Best Lawyers is a national organization that recognizes outstanding lawyers in each state in particular fields. Best Lawyers uses a confidential peer evaluation to select its lawyers. John Day has been listed in Best Lawyers of America every year since 1993, when John was just 36 years old. What is the lawyer's Martindale-Hubbell rating? Martindale-Hubbell is a lawyer locating service that provides a rating for each lawyer and law firm. The rating is based on votes from other lawyers in the community. Martindale-Hubbell rates The Law Offices of John Day, P.C. as Preeminent. In addition, John Day, Joy Day, Brandon Bass and Laura Baker all have Preemient ratings. Not surprisingly, younger lawyers will have a harder time getting ratings because they have not been around a sufficient time to develop a reputation and achieve a rating. But, if you are interviewing an older, more experienced lawyer, you should ask about their Martindale-Hubbell rating or look it up for yourself. What is the lawyer's AVVO rating? Avvo is a more recent rating system with evalutions from 1 to 10. The highest ranking possible is "Superb" which is a 9.0 to 10.0. John Day, Laura Baker, Brandon Bass and Joy Day all have "Superb" rankings. Does the lawyer have malpractice insurance? You might be surprised at the number of lawyers who do not carry malpractice insurance. It is not required, but malpractice insurance provides protection to you in the event your lawyer should make a mistake that adversely affects your case. At The Law Offices of John Day, P.C. we have carried malpractice insurance since the day our doors opened in 1993, and we will continue to have it for as long as we are representing clients. So when deciding on a lawyer, ask about malpractice insurance and get confirmation of its existence in writing. Is the lawyer board-certified as a Civil Trial Specialist? The Tennessee Supreme Court recognizes a specialty in civil trial litigation. Only about 1% of all the lawyers in the State of Tennessee have this certification. Why is it important? To be certified, you must have substantial trial experience, pass a two day examination and provide positive references from lawyers and judges. And, certification must be renewed every five years. Certification helps provide assurance that the lawyer has experience in handling and trying cases. Both John Day and Joy Day are certified as civil trial specialists. John is also certified by the American Board of Professional Liability Attorneys in the area of medical malpractice. John was awarded the National Board of Legal Specialty Certification's Lifetime Achievement Award in 2013. Does the lawyer contribute to the legal community? Membership in a bar association or legal organization is generally given to anyone willing to pay the dues, so we do not think much weight should be given to that fact. However, a lawyer who is active in bar associations and legal organizations tends to show the lawyer's passion for the law and advancement of the rule of law. And, of course, some organizations are especially important for injury lawyers. Tennessee Association for Justice and the American Association for Justice are two organizations that diligently work to protect the rights of injury victims and provide access to the legal system. While membership is an important factor you should consider, active membership is even better and the type of organization is important. Check the bios of our lawyers to learn about their involvement in the legal community. Does the lawyer have experience in your type of case? Ask if the lawyer has ever handled a similar case. Do some research on the lawyer's website to determine what type of law they regularly handle and keep in mind the old adage: a jack of all trades and a master of none. Does the lawyer have any sizable verdicts or settlements? You should also check and see if your lawyer has delivered speeches or been published in legal journals on topics involving injury law. What is the disciplinary history of the lawyer? The Board of Professional Responsibility, which is an arm of the Tennessee Supreme Court, polices lawyers in this State. Ethical complaints can be filed by lawyers or non-lawyers and a variety of discipline can be meted out depending upon the severity of the infraction. You can use the Board's website to look up the disciplinary history of the lawyer. If they have an extensive history, that is a red flag. If there is some isolated discipline, ask the lawyer about it and judge the response and whether it is something that causes you concern. What type of caseload does the lawyer maintain? This is a complex issue but you should have some sense of the lawyer's workload. For example, medical malpractice cases and some product liability cases are very complex and a full caseload will almost always be less than a dozen. Car accidents and other types of cases are not as difficult and time-consuming so a lawyer can handle many more of those especially if they have a well-trained staff. Ask the question and the lawyer's response can help you decide if your case is going to get a lost in a pile of other cases because the lawyer is over capacity. What do past clients say about the attorney? We exist to serve our clients so we are naturally very proud of the praise we have received from our former clients. To see what our former clients have said about us, click here to see our client testimonials. Has the lawyer been successful in the past? At The Law Offices of John Day, P.C. we know how to win. We have recovered millions dollars for our clients. Review some our successes here. Can the lawyer take on the opposition? Corporations and insurance companies will typically hire a team of investigators, attorneys and experts to try and deny your claim. You need an attorney who can help level the playing field and who can take on the opposition. At The Law Offices of John Day, P.C. if necessary to prove your case, we will hire hire experienced investigators and qualified experts -- whether the field is accident reconstruction, biomechanics, medical, economic, etc. And, we have a nurse on staff full-time to assist with medical issues and questions. Most importantly, our attorneys are fearless in the courtroom. What things should be red flags when considering an attorney? You should avoid a lawyer who promises you they can win your case because they have a special relationship with the judge. While you may see this in television shows or movies, it very rarely happens in real life. Judges have an ethical obligation to not allow their relationship with counsel affect how they handle a case and a lawyer who suggests he or she can manipulate that is most likely not telling the truth. To be sure, judges respect some lawyers more than others and there is a reason for that: those lawyers show up on time, are well-prepared, conduct themselves ethically and honestly and respect the court and the legal process. Another red flag is a lawyer who tells you the value of your case or what they can likely get you during your first meeting. Without a reasonable investigation, this is just not possible and the lawyer is likely only doing it in hopes of enticing you to hire them. What is the personality of the lawyer? This is the person you will be entrusting with your case. You want a lawyer who is confident, a good communicator, aggressive and likable. 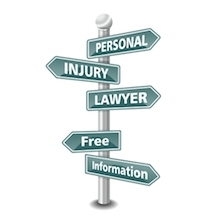 Injury cases do not resolve overnight, so you will be dealing with this person for some time. Do you like them and trust them? Many lawyers have commercials, including us, but it is difficult to form an accurate opinion based solely on a commercial. You need to meet the lawyer, preferably in their office. Sometimes this is not possible and you need the lawyer to come to you. But, if you can go to their office, make some observations while you are there. Is the lawyer's staff courteous? Is everyone professional? Is the office well-organized and neat? Is the lawyer on time? If not, does he or she acknowledge the delay and apologize for it? Is the lawyer prepared for the meeting? Does the lawyer satisfactorily answer all of your questions and explain the issues? We hope this information helps you make an informed decision when hiring a personal injury attorney. If you would like to discuss a case or any of these issues with one of our award-winning lawyers, contact us online or call us anytime at 615-742-4880 (Nashville) or 615-867-9900 (Murfreesboro) or 866.812.8787 (toll-free) for a free, no-obligation consultation. We will thoroughly review your accident and advise you of your rights. If your injuries prevent you from coming to our office, we will gladly come to you at the hospital or at your home. We look forward to proving why we are the right law firm for you.